I’ve had the very exciting chance to check out the Bible Illuminated preview online and it’s pretty cool. I mean just check out that cover! After having a look at it, I have to say I’m really looking forward to seeing a hard copy. 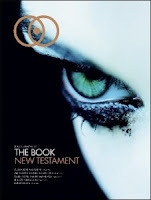 The pictures are pretty cool…I especially find it interesting that Angelina Jolie made it into the Bible. Certain verses and passages are highlighted or in a different color. It’s a whole new way of looking at the Bible. There is no religious mission behind The Book. We believe that its success will be driven by the fact that this is not coming from any specific faith, religion or church. We are from many faiths, backgrounds, and beliefs; ultimately we are trying to create something for the many and not just for the few. The goal is to drive an emotional reaction and get people to think, discuss and share. It’s meant to trigger bigger moral questions that will in turn help people to understand the common heritage between all religions through the Bible’s text. We hope people will find the images, design and layout intriguing–intriguing enough to talk about the actual stories in the Bible and what the morals and lessons mean to them. The more you know, the more you can participate in discussions about the world and understand the bigger picture. I want to read this! I'm so jealous I missed out on the early review promo. Looks really interesting. I received my hard copy earlier this week. I spent a lot of time looking it over last night. I'd hoped to review it today, but it's taking awhile to put my thoughts into words. Looking forward to your full review. It's pretty stunning. I'm really glad I picked this one up. Thanks for the tip. Gah, I just saw this in the store, but the freaky eyeball warded me off! I think I'm going to go back and give it a second look now, thanks! Just the idea that "There is no religious mission behind The Book" is offensive. The Bible is about God. This makers of this book just slapped some verses into a magazine filled with pictures of Angelina Jolie and calls itself a Bible? They didn't "slap some verses" it's the entire New Testament. And also there's only one picture of Angelina Jolie. having said that, I would say this is an interpretive piece of work. but many have said it's brought something fresh and new to the experience of reading the Bible and that's to be celebrated, right?